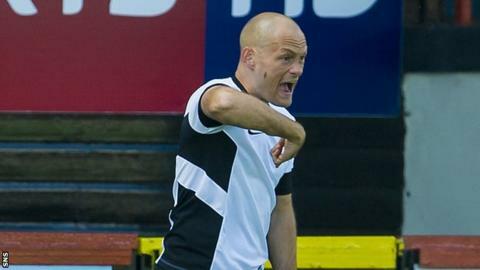 Player- manager Alex Neil praised Hamilton Academical's resilience after their 2-1 win over Partick Thistle. Just as the game looked like ending 1-1, substitute Jason Scotland fired home to earn Accies their third league win in a row. And, Neil was particularly pleased with the way his side fought until the end. "I'm delighted," he told BBC Scotland. "With five minutes to go, I didn't think that was going to be the case, but we showed our character again." Neil was complimentary of his goalscorers, saying : "Jason and Tony [Andreu] played a huge part in our success last season. "I've got great options and I knew bringing the guys on would add something to the team - luckily enough for us, they managed to pop up with the two goals. "I thought it was a good match. Both teams had chances and I thought we had the better of it. "We should've taken the lead with Ali Crawford but the goalkeeper made a great save, then they go up the other end of the pitch and score the goal. "You then think it's going to be one of those days but with the character, resilience, and quality we do have going forward, we managed to bounce back and steal the points." Accies now sit second in the table, a point behind leaders Inverness Caledonian Thistle, and Neil believes they can keep their momentum going. He said: "I'm really, really pleased. Performance-wise, again, we played well and it wasn't as though we nicked the three points, we played well enough to get them. "I'm delighted with the players' efforts and how well organised they are. I thought it showed again how much quality we do have. "We will continue doing what we're doing; we'll work hard, get ourselves organised - no matter who we're playing against- and we'll beat people in a game provided we play to our potential."